Wedding Bells are ringing with The 99 Cent Chef's latest budget dish. All heads will turn as you walk down the aisle, and into the happy couple's wedding reception, with this luscious entree. My Salmon Olympia should be a wedding reception dinner favorite -- see how it's all white and pink, topped with lightly toasted breadcrumbs? You know it will look lovely (like the bride) served as the main entree. And, the chintzy chef shows you how to do it on a dime. Plus, the in-laws will be pleased not having to shell out the big bucks for a typical, overpriced, catered seafood entree. For all you professional wedding planners, you don't have to admit where this centerpiece entree comes from -- go ahead and use it. Of course, you don't have to wait for a wedding excuse to try it out. I made it the other night for my wife and she loved it. See, the honeymoon never has to end! 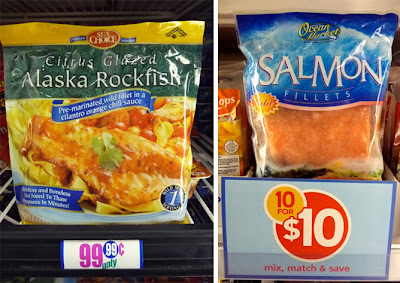 I always find 4 ounce fish fillets in my local groceries frozen deli case for around a dollar each. I've seen everything from Flounder to Rockfish, and Salmon to Tilapia -- and, my local 99c only Store stocks these 4 ouncers as well. The fillets are typically fresh frozen, so they defrost and bake well. 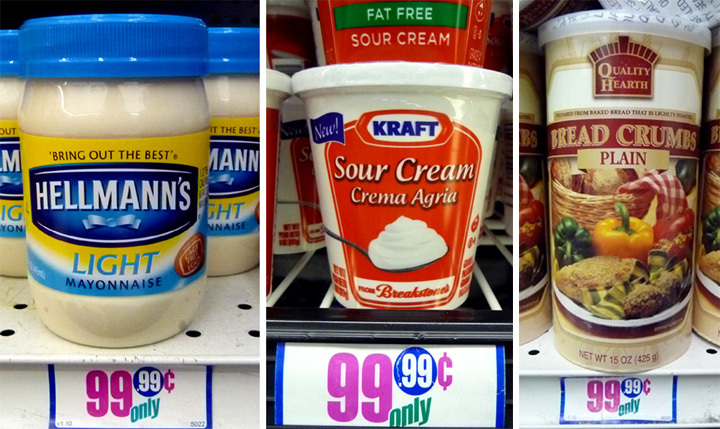 And, the other ingredients of sour cream, mayo and grilled onions are cheap all the time. 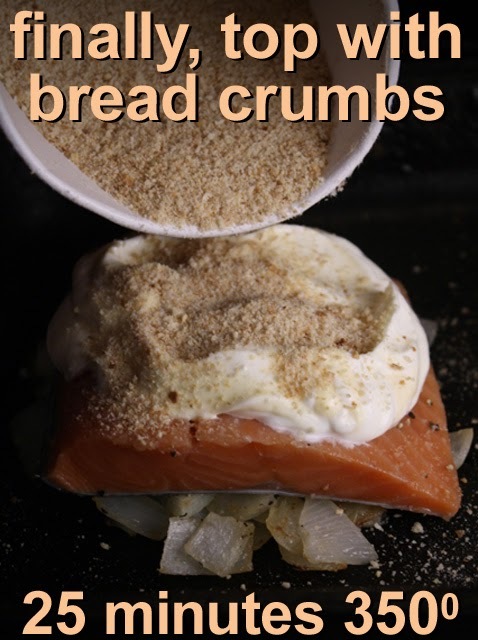 Breadcrumbs are probably the most expensive ingredient on this menu, but I also have an easy recipe (click here) for making your own -- if you are as much a miser as I am. You can keep the calorie count down with light mayo and low fat sour cream. 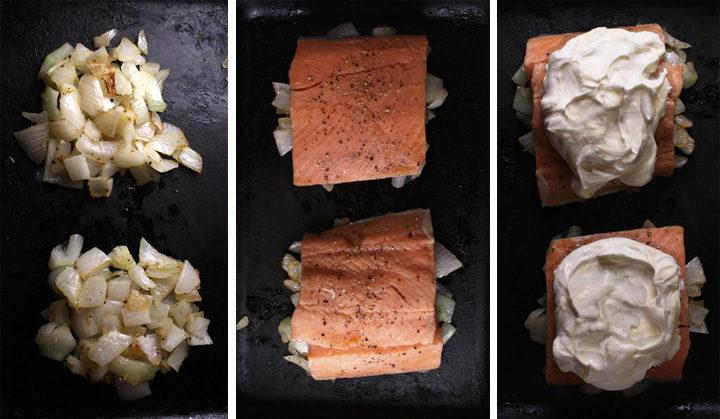 So if you, the best man, and bridesmaids are throwing around wedding recipe ideas, make sure to add The 99 Cent Chef's Salmon Olympia to the list, because you can put all the saved bucks toward the honeymoon trip! 2 fish fillets (about 4 ounces each) - any defrosted fish will do. I used salmon. Salt and pepper to taste - season fish fillets. 1 tablespoon cooking oil - traditionally butter is used (about slices), but I used a cheaper and tasty olive oil. 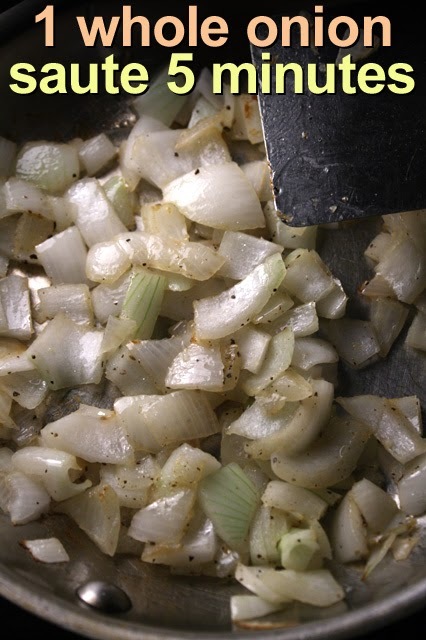 Heat oil over medium heat and saute chopped onion for about 5 minutes, until soft. While onions cook mix, 2 tablespoon each, sour cream and mayo in a bowl. Assemble Salmon Olympia on an ovenproof pan. First, add a 2 piles of cooked onion. Add salt and pepper to both sides of the fish, and arrange fish (skin side down) on each onion pile. Scoop on about 2 tablespoons of mayo/sour cream on each fillet. 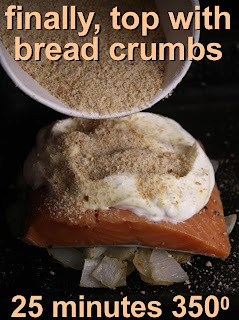 Finally, sprinkle on dried bread crumbs over the creamy topping. 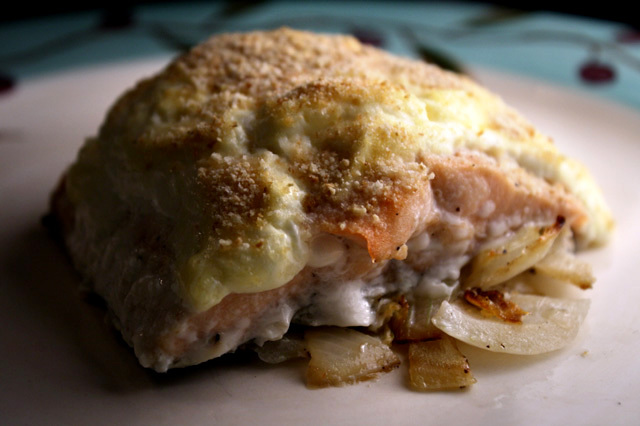 Depending on thickness of fish fillet, bake in a oven at 350 degrees for about 20 - 30 minutes. I used a wide spatula to carefully plate each finished Salmon Olympia. If your fish has skin, then place skin side down on onions. That way, the creamy topping cooks on the fish, not the skin. Also, you could just remove the skin. 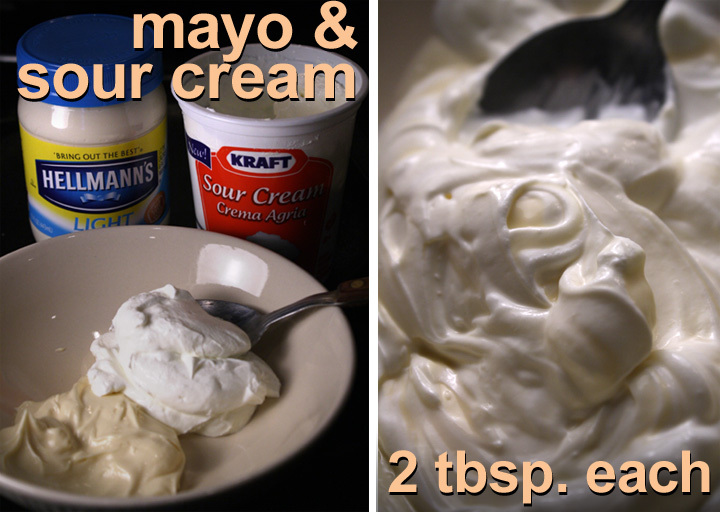 For a richer variation, try cream cheese instead of sour cream. Normally, the recipe uses raw onions under the fish fillet, but I like my chopped onions a little more caramelized, so I cook them some, first. Oh I'm still craving for this delicious menu~ wanna try it.